A new report, IPCE Works! Identifying Measures of Success and Evaluating Our Impact, explores key recommendations for evaluating the effectiveness of interprofessional continuing education (IPCE) in improving healthcare team performance and patient care. 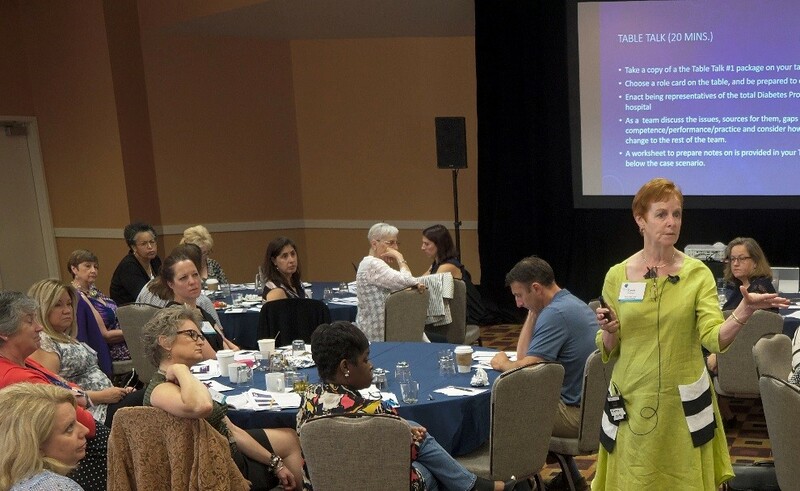 The report summarizes the 2018 Joint Accreditation for Interprofessional Continuing Education Leadership Summit, which brought together continuing education (CE) leaders from jointly accredited organizations across the country including hospitals, health systems, medical schools, specialty societies, and education companies. This year’s Summit brought together leaders in IPCE and team assessment with organizations that are focused on IPCE to explore opportunities to better evaluate and communicate the impact of IPCE on healthcare. This report is the third in a series. The first report, By the Team for the Team: Evolving Interprofessional Continuing EducationTM for Optimal Patient Care, and the second report, Promoting Research across the Continuum of Health Professions Education: Making Patient Care Better, are available at www.jointaccreditation.org. The Leadership Summits and reports were supported (in part) by the Josiah Macy Jr. Foundation. They were produced by the three founding accreditors in Joint Accreditation: the Accreditation Council for Continuing Medical Education (ACCME®), the Accreditation Council for Pharmacy Education (ACPE), and the American Nurses Credentialing Center (ANCC). Carole Orchard, BSN, MEd, EdD, speaks about how to effectively assess IPE teams. Assessment of interprofessional teams: Led by Carole Orchard, BSN, MEd, EdD, Professor in the Arthur Labatt Family School of Nursing at the University of Western Ontario and former Coordinator for Interprofessional Health Education & Research for the University, participants explored how to assess the transfer of learning into practice as it relates to interprofessional teams, interprofessional collaborative practice, and patient outcomes. Hot topics in IPCE: IPCE professionals had opportunities to discuss topics in-depth, to further learn from each other’s experiences in managing IPCE programs, and to share their summative reports back with the larger group. Tools and resources: Connie Schmitz, PhD, Consultant at the National Center for Interprofessional Practice and Education, introduced participants to the National Center’s Assessment and Evaluation Home Page and Measurement Instrument Collection, which contain a variety of tools and resources to evaluate the interprofessional team. 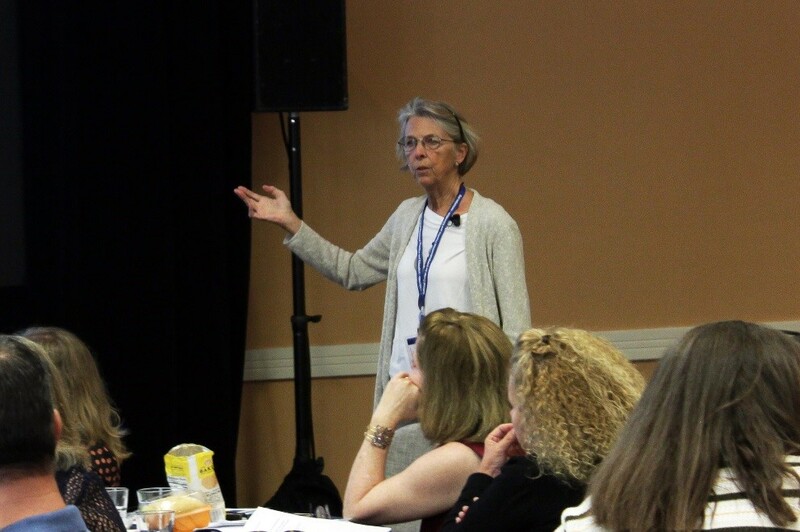 Connie Schmitz, PhD, Consultant at the National Center for Interprofessional Practice and Education, introduces participants to tools and resources to evaluate the IPE team. Jaime Luther, SSM Health, Anne Grupe, MSEd, American Society of Clinical Oncology, and Joni Fowler, PharmD, Creative Educational Concepts, discuss the expansion of Joint Accreditation for Interprofessional Continuing Education in one of the Hot Topics sessions. 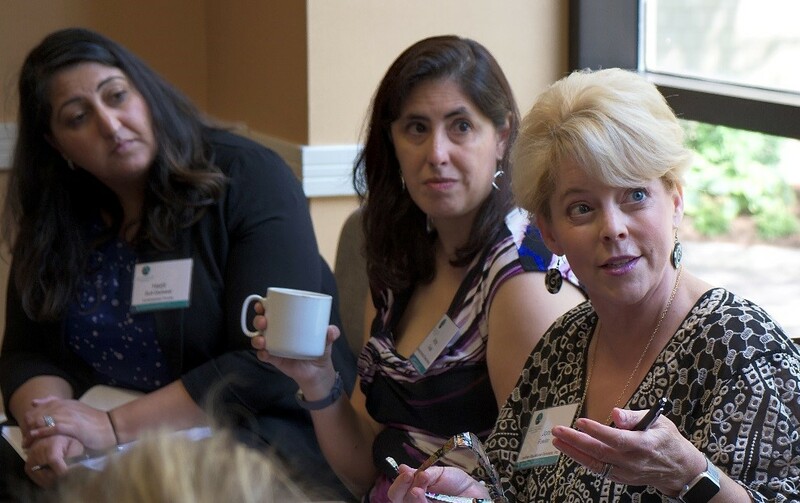 Joint Accreditation executive leaders are available for speaking engagements to discuss the opportunities for continuing education to advance interprofessional education and collaborative practice through the Joint Accreditation program. For more information, please contact: info@jointaccreditation.org. Joint Accreditation for Interprofessional Continuing EducationTM offers organizations the opportunity to be simultaneously accredited to provide continuing education activities in the professions of medicine, nursing, optometry, pharmacy, psychology, and social work through a single, unified application process, fee structure, and set of accreditation standards. Jointly accredited providers may award single profession or interprofessional continuing education credit (IPCE) to participating professions without needing to obtain separate accreditations. Joint Accreditation for Interprofessional Continuing Education is the first and only process in the world offering this benefit. For more information, visit www.jointaccreditation.org.